How much goodness are we capable of? In today's world wrecked by terror and death, you wouldn't even trust your next-door neighbour. 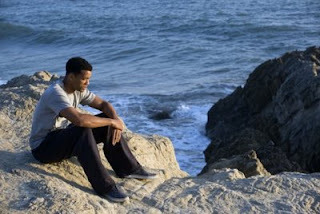 But in Seven Pounds, Will Smith plays a character who will literally jolt you out of your indifference. It would not be right to reveal the plot in my review because the storytelling and screenplay in the movie is fantastic, which keeps you guessing and wondering about the reason behind Will, who calls himself Ben Thomas in the movie, being so perfectly good. No longer do we see characters in movies today which sacrifice their happiness and come close to sacrificing their lives for the happiness of others. It does seem a bit unrealistic until you realize at the end that there was a very strong driving force, guilt, which made Ben the way he is. A small mistake which changes his life so drastically that Ben loses his identity and lives only for others. With this movie, Will has proven that he is an actor who knows what he is doing. Watch Seven Pounds for the strings that it will surely pull in your soul, and make you wonder: Am I capable of even a fraction of that kindness? Hmm..I think, I'll watch this one. Though the movie certainly gives a awakening and compelled us to re-thing what are we giving back to society?? Will certainily acted fantastically and upto the character demands but again this shud be seen as inspirational sense rather inspired sense..sacrfying ur life for other it is undoublty a remarkable and commendable in every sense needs a lot in a human being to achieve this feat..
1. Is our life and social status benefitting any one who is in desperate need of food..
3.are u doing enogh awareness in the people about the million female foeticide abored every year in india..
of course these are larger problems and to be look at the different level but the lesson v learn from this do not try to change the world and but change ur self..if one can we are there!! !